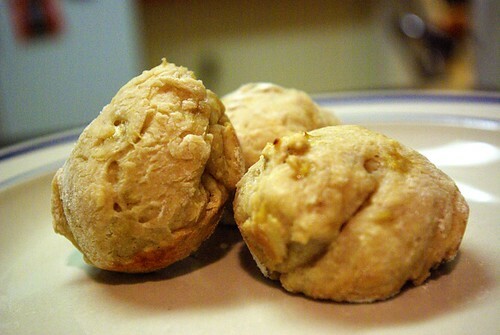 banana-tahini bread roll experiment, originally uploaded by aarn! +18th June, 2009+. just made these on a whim, without any real structure or foundation. as with most of these recipes, the amounts are approximate, this one needs a little fine tuning. mashed-up an overripe banana with 2T. smooth tahini, 1.5T. butter, 1.5T. brown sugar, a pinch of salt, 3/4c. flour, 1/2c. cold water, 1t. active dry yeast. didn't dissolve the yeast in the liquids because it was up in the air what the leavening agent would be. seemed to work out. kneaded until fairly smooth, then placed in the refrigerator for an hour. removed the dough, broke into ten small balls and let rise in an oiled and floured muffin pan for another hour, then baked at 350-degrees for 15-minutes (rotating the pan a few times during), until slightly brown.